Two more people were arrested on federal charges on Friday for chaining themselves to barrels in an attempt to stop management of bison in Yellowstone Park. The two people have yet to be identified, but the group that they identify with, Wild Buffalo Defense, sent out a press release saying that those arrested should be in court on Monday. 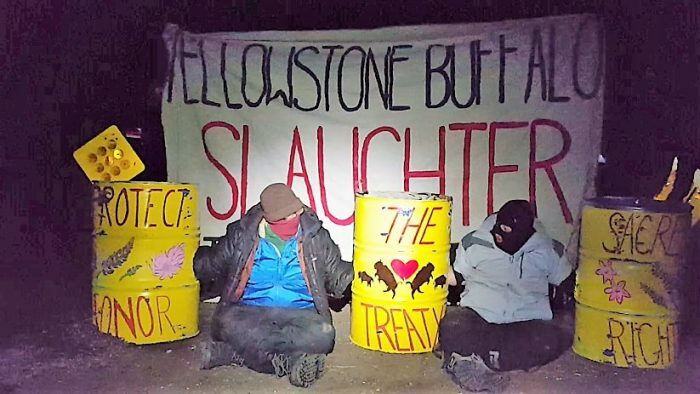 The group celebrated the arrest and sentencing of three ecoterrorists last week and asked for people to donate for future legal expenses, after the group members chained themselves to the chutes of the Stephens Creek capture facility in Yellowstone Park. The group claims that it wants bison to freely roam the plains.